15th November 1916. Edwin Charrington. D Social, 1905. Captain, 13th Bn, Essex Regt. Killed in action at Beaumont Hamel. 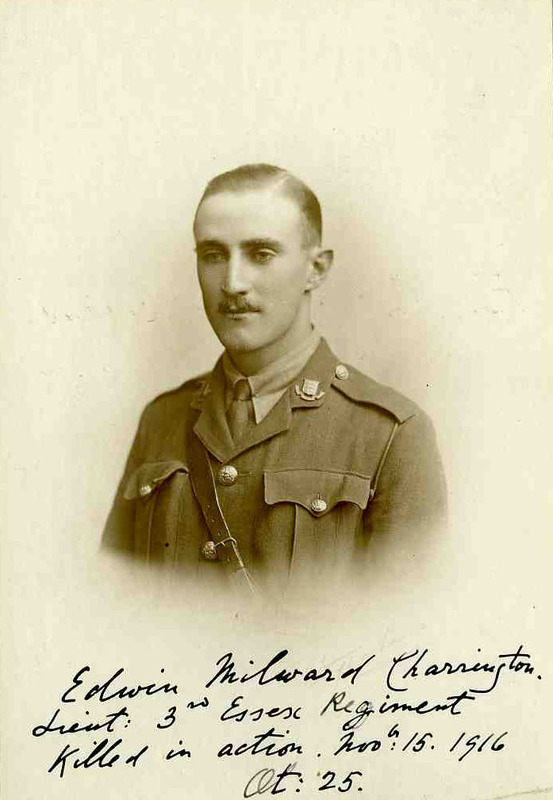 After leaving school, Edwin Charrington started work for Union Insurance Society of Canton, in London, with the view of going out to China later. But after two years’ service he relinquished his position, and on the outbreak of the War obtained a commission in the Essex Regiment. He left for the Front on 14th February, 1915, returning to Britain at the end of May, badly wounded and disfigured. After a few months’ leave, he rejoined his regiment, and on 31st May, 1916 he again left for the Front. His Colonel wrote: I had the greatest regard for him and a high opinion of his capabilities as an officer. He was beloved by all who knew him, and a most gallant officer and loyal friend, and he will be keenly missed by all ranks. Posted in Commemorating the Fallen of WW1 and tagged 1st Battle of the Somme, Captain, D Social, Flanders & France (Western Front), killed in action on 15 November, 2016 by archives602.